Thank you, 16th Fall Classic attendees! Musicians and friends enjoyed a day and night of casino-themed fun at the Music Fund of Los Angeles 16th annual golf tournament on Oct. 16, 2017. More than 80 golfers arrived at Brookside Golf & Country Club in Pasadena greeted by warm sunshine, complimentary breakfast, and live musical entertainment from the Hodads featuring AFM Local 47 talent Tony Jones on drums/vocals, John Hatton on bass, Robert Schuster on guitar, Sterling Smith on keys, and Woody Manknowski on sax. Among our many esteemed guests were Music Fund and Local 47 titled officers President John Acosta, Vice President Rick Baptist, and Secretary/Treasurer Gary Lasley. We were thrilled to welcome very special guest Hal Espinosa, the founding president of the Music Fund, who traveled all the way from his new home in Maryland to attend the festivities. Golfers enjoyed a sunny day on the impressive course, with our favorite “two trumpeters on the green” Jack Coan and Jerry Kadovitz once again providing comic relief with their unique musical commentary on the success (or not) of golfers’ drives. The party continued into the evening at the “Casino Night”-themed banquet with more live music, a hosted bar and dinner banquet, silent auction, raffle drawing, and awards ceremony. Attendees bid on silent auction items ranging from such prizes as resort and spa getaways, tickets to see the Los Angeles philharmonic, and original score sheets signed by their composers including the Oscar-winning themes to “La La Land” by Justin Hurwitz and “Star Wars” by John Williams, and “Family Guy” by Walter Murphy. After dinner, Tournament Coordinator Philip Di Nova presented prizes and award trophies to the tournament winners. Many thanks also to all of the golfers and volunteers who helped make this year’s tournament a great success! 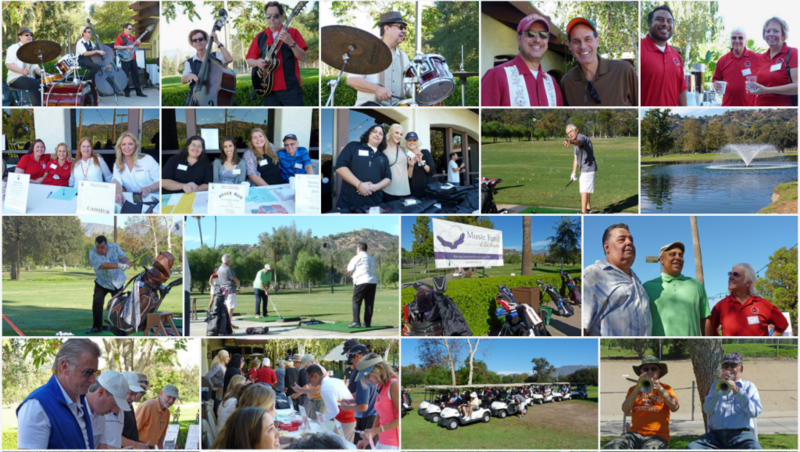 The annual tournament raises funds to benefit musicians who have fallen on hard times. All proceeds benefit the Music Fund of Los Angeles, a 501(c)3 nonprofit assistance fund that provides a resource to help musicians in financial distress who cannot work due to a sudden illness or injury. The Fund also works to spread the arts throughout our local communities with musical programs, often presented free to the public. We look forward to seeing you all at next year’s Fall Classic! For more information and to make a tax-deductible donation, please click here.